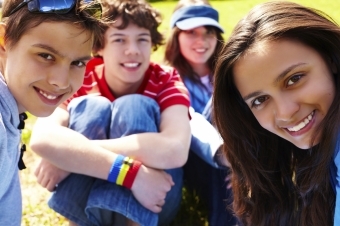 At Smile Town North Delta, we know that for teens, resisting peer pressure can sometimes be pretty difficult. But there's never a better time to resist than when it comes to smoking – and that's true both in terms of overall health, and oral health, too. Most people know about the increased risk of lung cancer associated with smoking cigarettes, but not as many people are aware of the oral health problems that smoking causes. Some of these oral health problems, such as bad breath and tooth discolouration, are just unpleasant to the senses, but teens also take some very serious oral health risks when they decide to light up. Smoking cigarettes can increase the buildup of plaque and tartar on the teeth. This causes cavities and tooth sensitivity as a result of the acid in the plaque that eats away at tooth enamel and dentin. The excess of tartar and plaque caused by smoking may also contribute to the development of gum disease, which can eventually result in tooth loss, and loss of jaw bone density. The best way to stop your teen from smoking is by making sure he or she is educated about the risks associated with it. It's important to start talking to your children about the risks of smoking as soon as they’re old enough to understand. On the other hand, though, it’s never too late to start talking about it, if you haven't yet! To discuss this topic with you child, prepare a bit in advance by doing some research, and then sit down together for a earnest, straightforward discussion about the risks associated with smoking. It doesn't have to be a long talk, but be sure to go over all of the more serious health issues in detail. But don’t forget to mention things like bad breath and discoloured teeth! Being young, teenagers tend to feel a bit invincible when it comes to their health, but they also tend to be very self-conscious about their appearances, and what their friends think. That means that bringing up the social issues associated with smoking can have a bigger impact than the scary health issues! If you need help talking to your teen about the oral health risks associated with smoking, contact Smile Town North Delta today!